Skill Level: Intermediate to Advanced. Must have basic knowledge knowledge of and comfort with right-angle weave. When Lisa Niven Kelly taught at my studio, she shared images of her daughters, Izzy and Lucy, two beautiful little girls on a sunny California day, playing in their backyard. The sunlight played with them as they swirled and turned unselfconsciously before a sensitive photographer's eye. 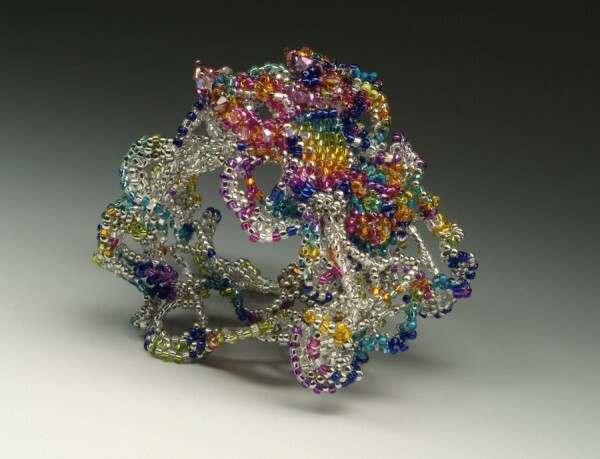 These images stole my heart: my beadwork could not help but to follow. I began to wonder, what would happen if right angle weave were to embrace the same grace and freedom of movement as Izzy and Lucy? If I kept the integrity of the thread path but loosened all other rules matching the dance of two precious children caught in moments of spontaneous joy? If I chose soft colors and did not care how many beads were being used in each square? If I let the idea of squares give way to swirls of color? I gathered my curiosity and beads and watched behind my mind's eye as the beadwork formed a delicate netting to hold the memory of visual delight. 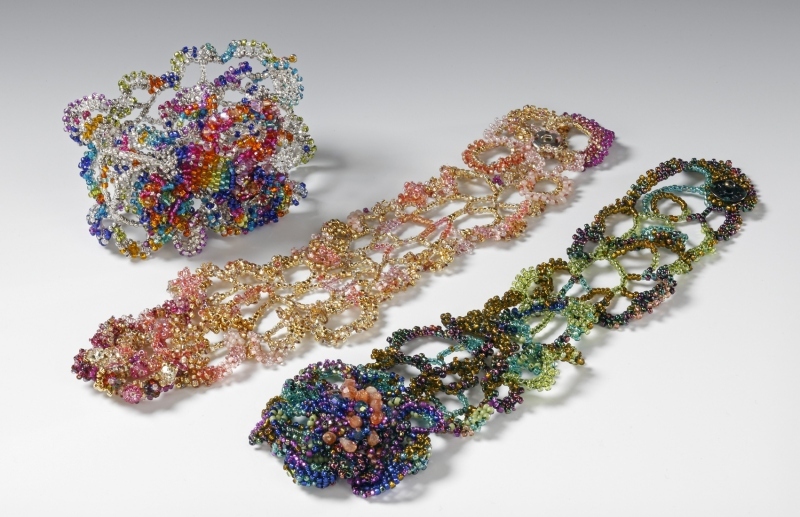 As in any free form beading project, the colors of beads you select is as much a part of the creative process as how you use the technique itself. Following is a list of suggested seed bead colors. Please remember that the following list is a SUGGESTION rather than a “must have” list. Each of my samples is different. The sample you see is only one of many possible color options. ALL SEED BEADS IN THIS PROJECT ARE SIZE 11. You will need to have a base color. The base color is made up of a mixture of either gold or silver seed beads. Gold and silver seed beads are tricky to use, as the finish must be stable. Here is a list of gold and silver seed beads in which the finish is stable. Depending on the size of your wrist, you will need approximately 7 grams of each color of silver or gold listed below. 24A, 57, 300A, 300G, 318L, 318M, 327K, 356K, 585, 634, 640A, 704, 706. These colors work with either the silver or the gold base. 3mm/4mm crystals and/or firepolish and/or3mm pearls for embellishment. Snaps...one or two size 2 and one size 3. Beading thread: either 6 lb test Fireline, Silamide A or Nymo D to match your color palette. Beading surface, scissors, light, magnifying glasses or visor. If you have any questions please call me at 847-831-4794. See you in class!